Experience ease and confidence in trading binary options with OptionsXpress review. This binary options broker review will deal with what makes this platform different compared to others. This options and futures broker allows you to trade your favorite products all in one account. With features that stand out among the rest, OptionsXpress sure has its special way of providing quality service to its users. As part of The Charles Schwab Corporation, you get the chance to access expert financial advice and exclusive broker services, and even banking through the Schwab Bank. Aside from being a proud member of The Charles Schwab Corporation, Options Xpress also holds an extensive list of helpful features. One of its strong features is its All-in-One Trade Ticket, letting you trade various products and build strategies in a single platform. This innovative broker enables you to conveniently trade at home, in your office, or even on-the-go using its modern trading technology. Other features that differentiate OptionsXpress from others include the Strategy Scan, Trade and Probability Calculator, and Virtual Trade. This Virtual Trade account offers a risk-free $/€/£25,000 to let you test your formulated strategies and insights. With this practice trading account, you can use the actual platform in order to get familiarized with its functions. In addition, Options Xpress also keeps a comprehensive collection of learning tools such as in-depth videos, charts, and skills tests. These provide you with adequate training to master different trading strategies such as bullish, bearish or flat market conditions. 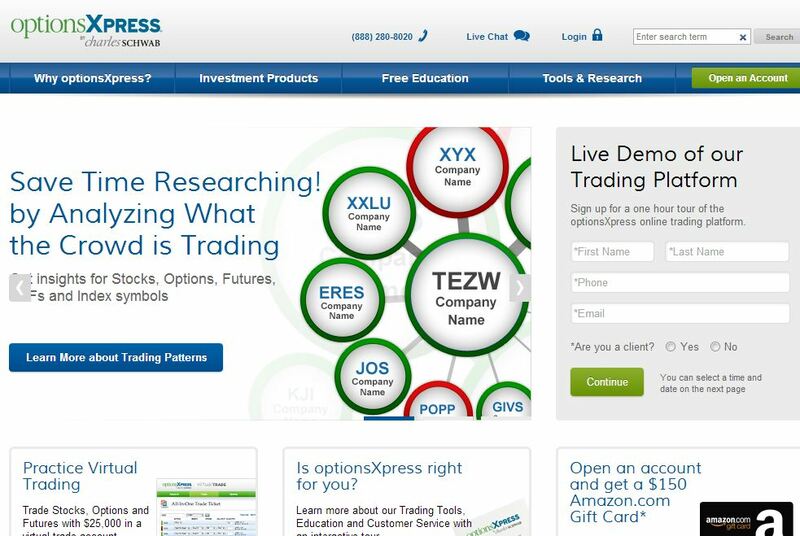 OptionsXpress offers numerous products you can trade. These include options, futures, stocks, bonds, and even mutual funds. In line with these assets, you also get free real-time quotes and charts that can greatly help users in trading these assets, especially the newbies. Add to that the fact that it features new functions such as trailing stops, triggered orders, one-cancels-other, and future spreads.